Completed puzzle measures 60" x 40"
It was fun to make this big puzzle. Loved this puzzle had enough distinctive area's that you could keep moving even at the even at the beginning. Thank you - LOVE IT!!!! We build 5000 and 6000 piece puzzle regularly. It’s as big as our table will hold. This one is our favorite yet. Very interesting pictue with tons going on. No Big chunk of sky to deal with either. Highly recommended for the large puzzle builder. We do 5000+ piece puzzles all the time. This was the best one ever. Tons of detail to build. And it comes with a large picture so you don't have to use the box cover to build. I would definitely recommend this puzzle if you want to be challenged. Enjoyed putting it together. I just finished the Ravensburger 3000 piece ' Beneath the Sea ' . 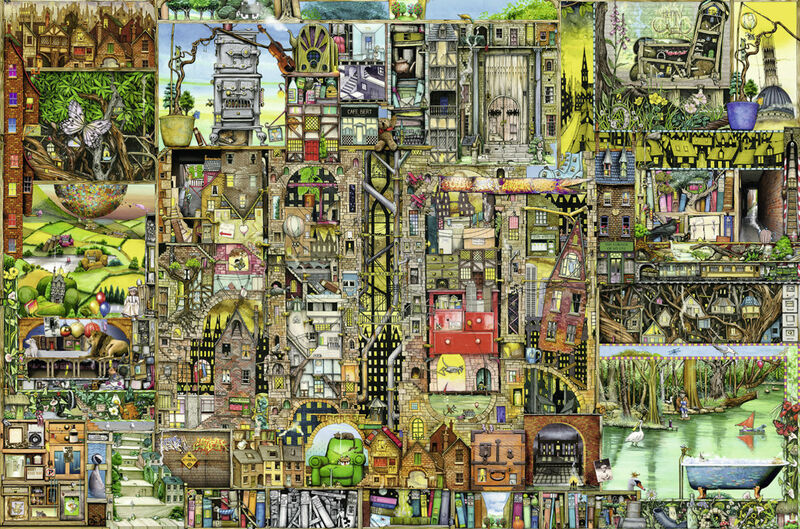 I was looking for the next challenge and I saw this one ( 5000 piece high detailed illustration by Colin Thompson ). Ravensburger always has the highest quality puzzles and I own over 10 of them. This puzzle is listed at 60" x 40" , so you are going to need a large surface are to complete. I would recommend use a few large aluminum baking pans to separate the pieces by color or by section. The 3000 piece took 2 weeks to complete, so I am figuring that this is going to take a month to finish. So I am going to save this one for the cold Winter months. This one has been on my Wish List for awhile. I can't wait to dive into this one. Thanks Puzzle Warehouse for the quick delivery and Free Shipping ! This puzzle was a blast to build! It was my first 5000 piece puzzle and I feel I made the right choice. The image is clear, sharp and full of detail that make it very easy to distinguish the different sections. This puzzle is only difficult because of the sheer volume of pieces to sort though, once you get a handle on the different sections, assembly moves pretty fast. I've done smaller puzzles that took longer because of difficulty of the image. This would be a great puzzle to frame and hang in a game room or finished basement. As for the quality: Ravensburger, of course, produces the highest quality puzzles in the world. Even the reference poster was printed on linen paper! Low glare, thick pieces (only 3 or 4 were bent or frayed, but with 5000 pieces it's statistically bound to happen. No problems in assembly though.